Whether your foundation just topped $1 million or $1 billion in assets, you probably experience the same challenge when it comes to communications: Not enough capacity. Sometimes you just can't do it all. This webinar will feature essential storytelling tips, highlight creative ways to repurpose your existing work and show you how to efficiently use downtime to stock a pantry full of useful ingredients to tell the right story when you're crunched for time. And for those times you have some financial flexibility, we'll talk about how to find the right consultant to help you finally move that back-burner project out onto the table. This webinar is hosted by the Council of Michigan Foundations. 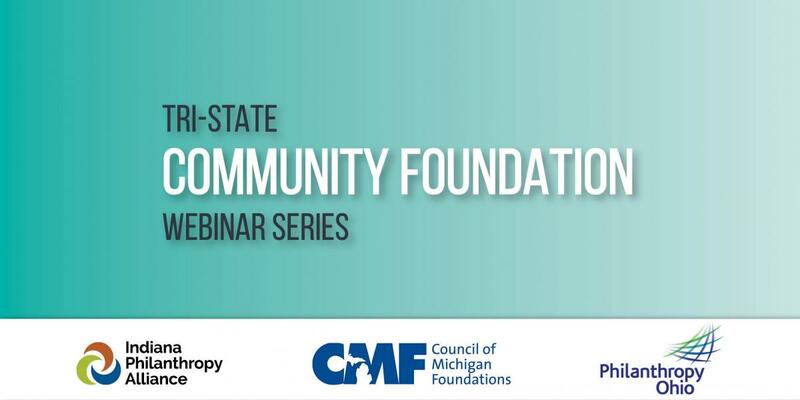 The Tri-State Community Foundation Partnership webinars are designed for, but not exclusive to, community foundation staff and board members and is a partnership between Indiana Philanthropy Alliance/GIFT, Council of Michigan Foundations, and Philanthropy Ohio. Robin Miner-Swartz has merged two decades of experience in journalism and community philanthropy into her own consulting business. She has a passion for writing, editing and managing publications to ensure they deliver clear, compelling messages. She has presented at statewide conferences and traveled across Michigan to help organizations become better at telling their stories. As Vice President of Marketing and Communication for the Capital Region Community Foundation, Robin planned, reported, wrote and designed CRCF’s award-winning, magazine-style annual report. She also created a toolkit for agency fundholders to help promote their endowment funds and a series of brochures designed to help professional advisers advocate for philanthropy to their clients. Robin has presented at CMF conferences, collaborated with other CF communicators to develop new marketing materials and served on the steering committee for CommA, the national organization for communication professionals at community foundations. Please register by Monday, December 10, 2018 at 5:00 pm. Questions about registration should be directed to Belinda Gray at bgray@inphilanthropy.org. Unable to attend the live webinar? Register now to receive the recording and slides after the webinar is completed. You must be logged into the website to register; then click the "Register Now" button above. If you do not have an existing account, you may register for one here. Please allow 48 hours for account approval, or for immediate access you may contact Marilee Steckler at 317-630-5200 Ext. 113.